I took on a local mail art initiative. Actually, it was my idea and someone followed up on it and I said yes. That's my current excuse for why you aren't getting any mail art from me and why I am a bit slow blogging. But to be fair, I was sick for weeks and I've had lots of art things making demands on my mail art time! I have been sending mail art back to the people who send me stuff for the local thing - Suffolk Open Studios Mail art: http://suffolkopenstudiosmailart.blogspot.co.uk. 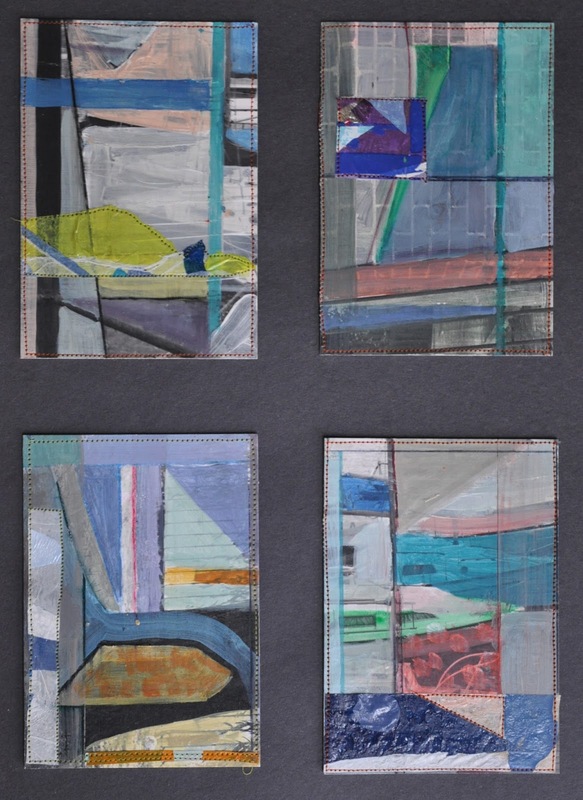 The idea is that if we hang local artists mail art in a good central location we can attract people to visit their studios from further afield. It's been a little hard for people to get the idea. So I feel I need to send stuff in a timely manner back to them so they get the concept that it's a trade and have a positive mail art experience. In other words, those of you who I should have sent stuff to have been bumped down the list to make way for this other stuff! I have about 15 more to send to… so this afternoon I decided to make some things that interest me using some photos I chopped up a few years ago that I found in a box of stuff I bought at the car boot sale. 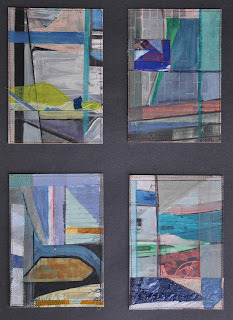 I did a few postcards when I chopped them up in the first place and I loved the results and because I've been using lots of fused plastic, and think about Diebenkorn when I make those (often) I figured, what better way to spend a Friday afternoon! Now it's time to go back to the house to do chores. I promise to blog the four enticing pieces I have had in my crab shell letter holder for a few days, or more, (FROM YOU) tonight. and if there's time I will make some more of these. I will save the best ones for you guys.